Since my last release, I have been doing many things while I wait for the ruling in regards to Break the Stigma Fitness's license suspension. to help pass the time, I spent the majority of my days making awesome memories with my daughter before sending her to Minnesota. 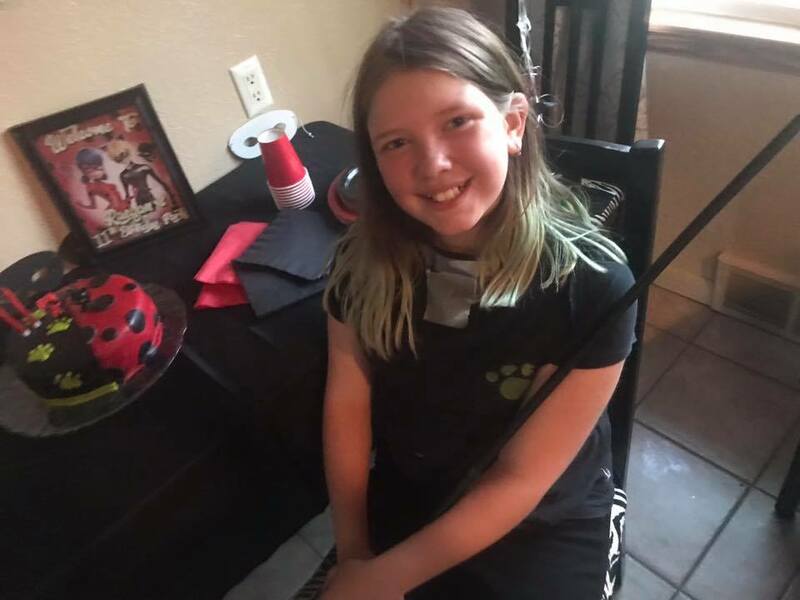 We explored, and I threw her a grand Miraculous Birthday Party topped with a home made double layer chocolate cake, pinata, and had a bunch of kids over for a sleepover! I have to say, out of all the events I have thrown in Colorado, this was by far my most successful, just look at these smiles. Since moving here, I am truly grateful because I have nothing but support from my daughters friends and their families. My daughter has also completely flourish in the community earning awards in art, music, and in personal development in school. I put her on a plane last Sunday, then came home to this house that has become my own personal hell. Try to imagine the pain that would come with losing not only my home, but my business too, and at the same time. I can only say, it’s beyond heartbreaking to put it lightly. I came in the door and thoughts began to rush in. I completely broke down as I thought how Rae would never come through those doors again. I cried for some time, then remembered; I have gone through harder and I needed to focus energy on my upcoming tour and own health. I refocused and set my alarm for 4 AM in an attempt to catch the sunrise and alter my mood. I was out of the house by 5:20am, but ended up being cloudy so I didn't get any good shots of the sunrise. Regardless, I spent my day driving through the mountains and exploring this beautiful Colorado landscape. I went for a hike but grew frustrated because I couldn't track and share my fitness like I once had. This was because my FitBit broke and my replacement watch, the Apple Watch 2 and I never got along. I decided enough was enough and was able to trade them in for an LgV30+ and Fit Bit Ionic. I grew very excited. Soon, I could track my progress like I had before. This was something that I always loved because it greatly motivates me to stay consistent from day to day. Tuesday I woke up to a request for an interview regarding the attempted revocation from a writer at The Denver Westword. You can read that full article here. This was released last Wednesday morning and has since received over 1000+ shares in support. I have also received many messages of encouragement along with a $500 donation for my upcoming tour that I am so excited to start. In addition, many neighbors in my community have have left very positive comments via a Facebook page I was added to recently. Thank you all. Please know how humbled I am by everyone's support throughout. Just a few hours after this release, there was a knock at the door. I recognized the detective who had been here before regarding the suspension. I quickly signed the “hand delivery notification”, then was given the official ruling. The decision had been made: Order for Permanent Revocation. You can read the full judgement here. I maintain I obtained my business license for BtSF, true, transparent, and legally. I only ask that you read this in its entirety then come to a decision for yourself because sometimes, things are not always so black and white. I can't promise to give you all the answers, but what I can promise you is this; nothing was done fraudulently or with ill intent to my community, neighbors or municipal officials. In fact BtSF added great value to our community. Please know I only wanted to build a safe and comfortable space for individuals to learn about and partake in cannabis therapy exercise. In short they have deemed Break the Stigma Fitness to be in violation due to technicalities. They ruled since I did not write on the business license that clients would be allowed to consume cannabis on the private property, I was in violation. The ruling sides with the cities claim they did not know BtSF was cannabis friendly. In my defense I would like to go over all interactions myself and those representing BtSF had with the city. Jane Schmitdz, a real estate agent from Minneapolis, MN made the first contact with the "Planner of the Day" on behalf of BtSF in June of 2017. The topics of discussion during the first conversation are as followed; distance away from school, where clients would park their vehicles, cannabis consumption on property, and cannabis legalities of gifting where she was told “As long as you are not selling it you are fine, because you are within the legal limits of the law.” His only concerns during this initial conversation was the availability of parking. He said he would return her call with his findings. 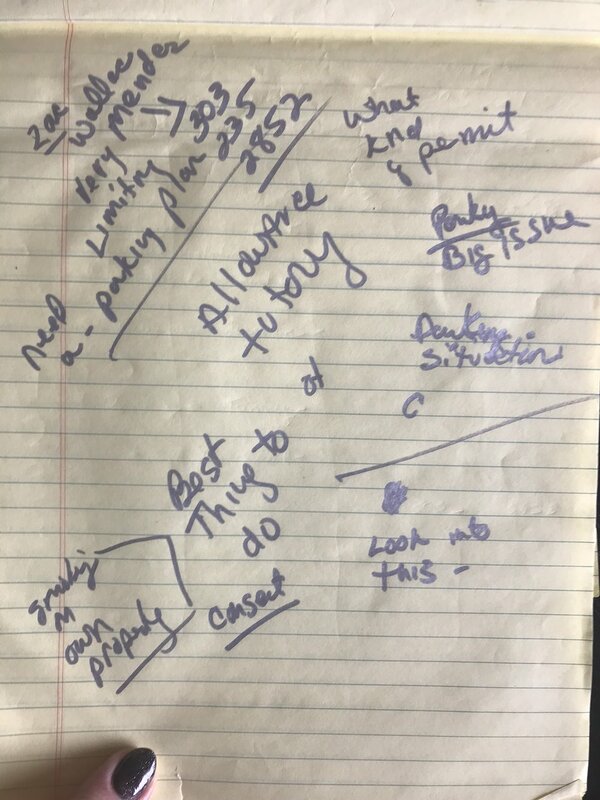 Two days later he did just that and a second conversation ensued where they discussed at length where clients would park since no parking was available on 38th, and we only had space for 7 cars on property. He explained clients could park on near cross streets. At no point during the second conversation was there any mention of issues or potential issues with allowing adults over 21 to consume cannabis in the private home business. At this point she, on the behalf of BtSF, was given a go and told to come apply. 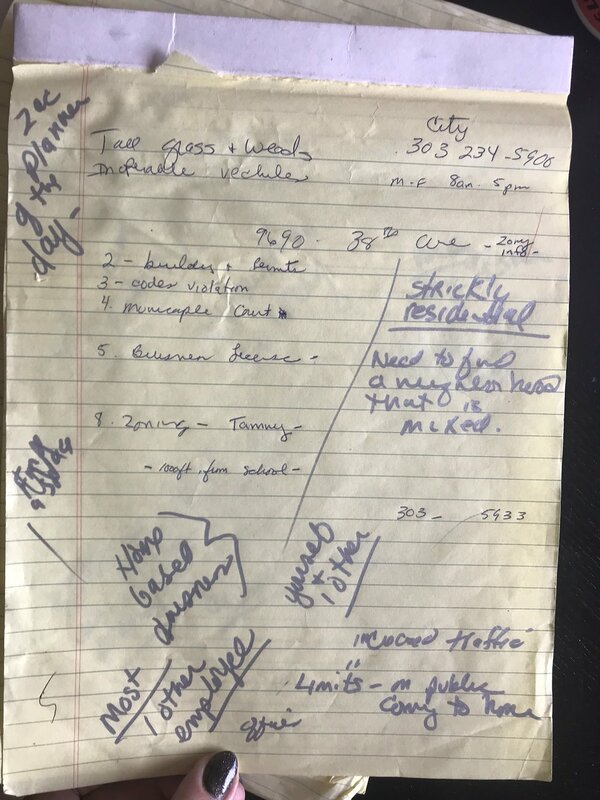 You can see her hand written notes from these conversations that took place last June with notes reflecting this. I too spoke to the city after Jane to verify what she had told me. I spoke to an older gentlemen in zoning who's only concern was where the cars were going to park. We discussed how the blacktop would fit about 7 cars, and the extra 3 client cars and instructor (if at capacity) would have to park on Independence. I agreed and he told me to contact the Representative in the Tax and License Department. I was ecstatic at this news and spent all my time renovating the space to prep for the Soft Opening on July 9th and Grand Opening on July 23rd. To get the word out, I appeared at events and told my followers on social media. It didn't take long before I started to receive request for interviews, and spoke to publications about my plans for Break the Stigma Fitness. This also helped a great deal with getting the word out. The grand opening was advertised as a private, free 21+ cannabis friendly fitness event that all members had to preregister for. It was a successful event where we had nearly 60 people show up in support throughout the day. 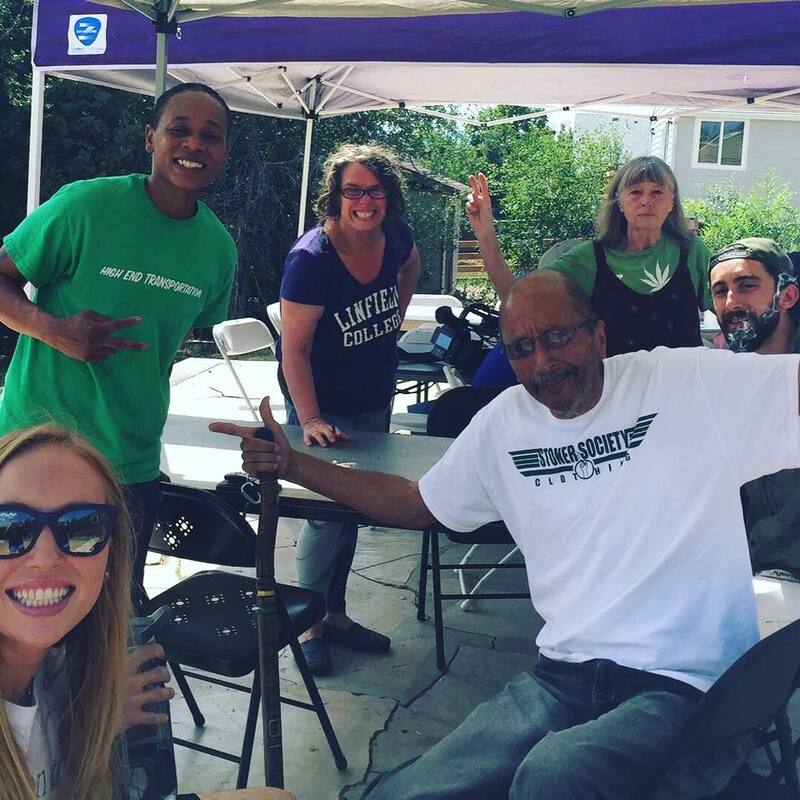 This was a special time where I was able to get to know many #CannaAthletes and learn valuable ideas about the needs in the community.I have to say, It was one of my favorite memories while in Colorado. Through the month of August I continued to reach out to those in the community to learn about the needs this space could provide, in exchange for free experiences. 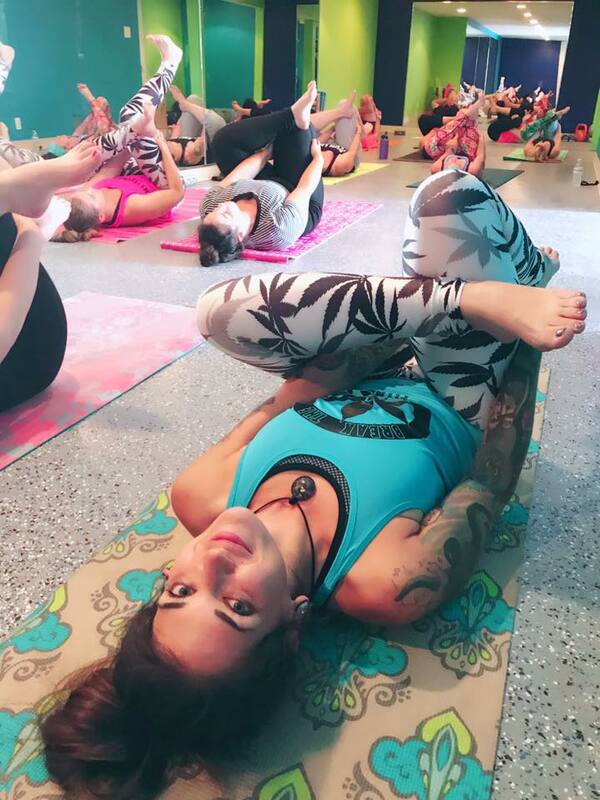 I was also working on building the best team of cannabis friendly yogi's and fitness instructors so we could learn even more together and continued to build our presence in the community. Since I did not have goods or services for sale yet, I wasn't in a rush to get my local license until September, when I was planning on offering experiences and education in exchange for money. 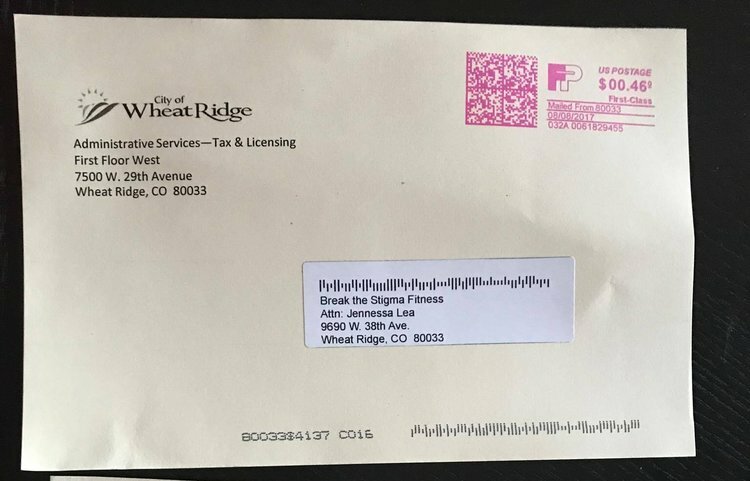 In early August I received the notice below from the City of Wheat Ridge regarding my license. I immediately called the Wheat Ridge Tax Department and spoke to Donny, the same man who Jane and I spoke to before. I apologized for not applying yet and explained how our cannabis consumption friendly Grand Opening Event had been free. Since no goods or services were sold, no taxes would be owed for that event. He went on to report that he had been on the website, seen some advertising for the Grand Opening and read that we were a cannabis friendly fitness center. I informed him these were all truths, and that I was one of the people who had called months before asking questions about doing just that. At this point he reassured me and said BtSF would be able to be a licensed legal residential home business, I would just need to fill out my application within 15 days. I went into the Tax and License Department to fill out my application with the help of the Representative that following week. Honestly, I remember being very excited over my new business venture and how supportive the city was being. I even wore a BtSF logo shirt that has a big pot leaf on it. The Representative himself testified seeing me wear that day, during the hearing. I also remember wearing a colossal smile on my face too, because I was proud. Proud to be live a in a community where my business was accepted, I could follow my passion of helping others, and do so without any fear. We discussed my plans further as I filled out the application, paid the proper fees, then left to wait for my official response at home. At no point did he ask to include the information we discussed then and in previous conversation about how cannabis would be apart of BtSF. Also know there also wasn't a place where this information is asked on the application for me to disclose, so as far as I knew, talking to those in the department was what I needed to be doing. A few days later, it was official. Break the Stigma Fitness was approved with a Residential Zone 1 Business License! What was the basis for the Hearing? Their witness denied having conversation with Jane and myself regarding the transparency of the cannabis use to happen at Break the Stigma Fitness. Was I charged with any criminal charges? No, I have not been charged with anything criminal. I will say that I think this decision was made before I walked in that door to the hearing. They were determined to shut me down instead of try and work with me which is something I did ask them to do. I think they did this because they wanted to set a case precedent that people would not be able to have consumption friendly businesses in their home, even tho there is no law saying this. Through all of this, what hurts the most is having my character attacked. I would never defraud anyone, let alone the city I wanted to make a forever home with my daughter and build a business in. Today my be my last day in Colorado for now, but its not the end of Break the Stigma Fitness or Fit Cannabis Girl. After I unpack and take a few days break, I will be back on my Fit Cannabis Girl Grind. I look forward to sharing my knowledge and journey with cannabis, fitness and nutrition during my back to health and wellness US #BreaktheStigma tour! To stay in the know, be sure to subscribe to my blog and follow me on Instagram, Facebook, and Twitter! To help support this new chapter, I am seeking support in the form of sponsors and partnerships from cannabis brands all over the US. If that sounds like you, please click here to contact me here! And for those who would like to personally donate to this cause, please click here.